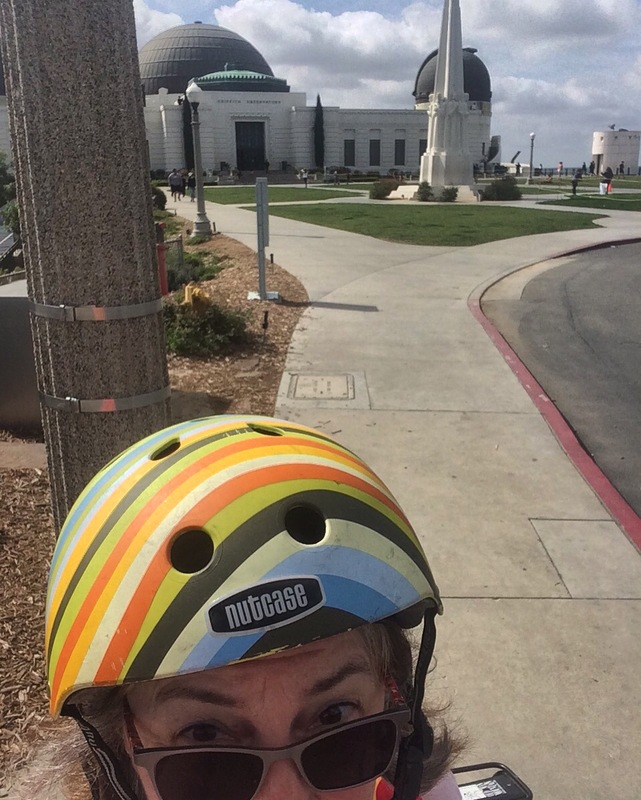 Errandonnee: My Mad-Dash Exploits – WeLove2Bike! Having so thoroughly enjoyed the Coffeeneuring challenge orchestrated by Chasing Mailboxes last Fall, I could not resist accepting her next challenge, the Errandonnee. 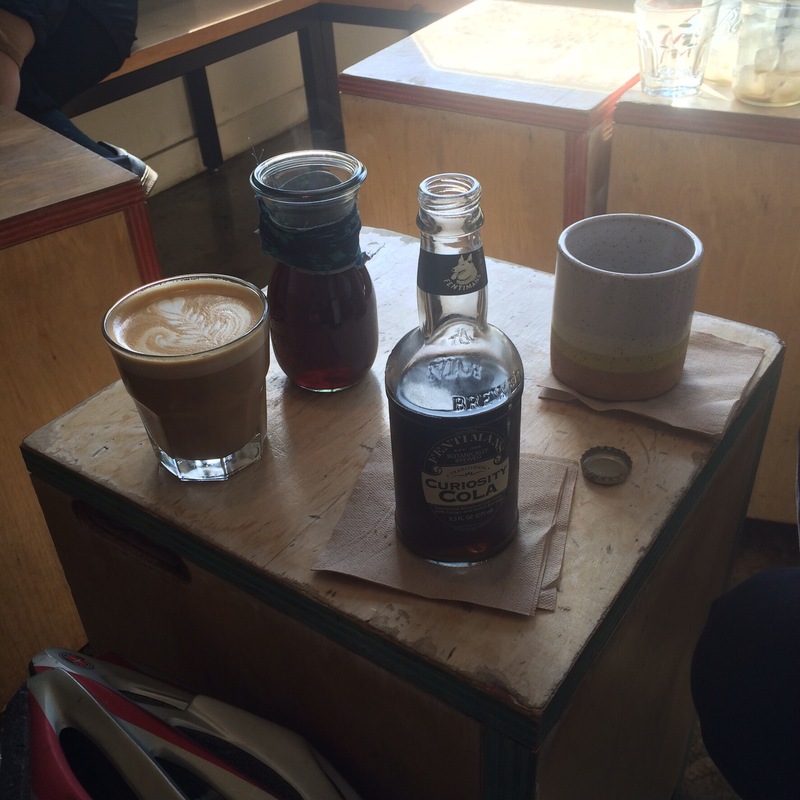 With Coffeeneuring, the challenge was to visit seven different coffee shops by bike over seven weeks, staying within some rules and documenting the events accordingly. The schedule for the Errandonnee challenge, however, is a bit more compact: 12 errands in 12 days, hitting at least seven different categories. As luck would have it, I was out of town for the first half of those 12 days (March 4-15). Normally visiting another city would add to the fun, but my schedule for these travel days was packed, and managing any of my tasks during that packed schedule by bicycle just wasn’t practical under the circumstances. Errandonnee #1, March 10th: My first day back in town, I rode my bike to work, as I normally do. No biggie. Off to a great start! Category: Work. Miles: 1.2 (one way – the direct route – no time for lollygagging along the scenic route!). Bike: Gazelle Tour Populaire. 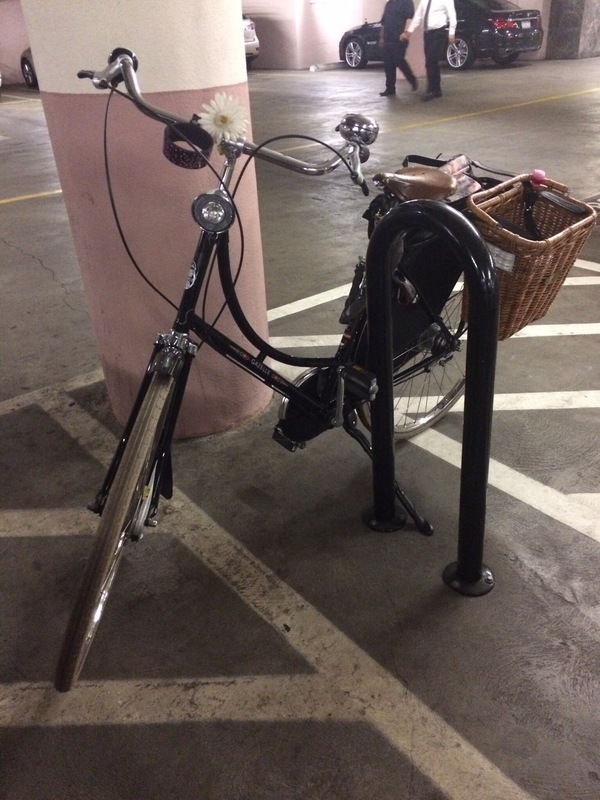 Observation: I really need to fix the left handlebar grip on my Gazelle. It came loose before I left town, and it slides off every time I accelerate, and especially when I go uphill. 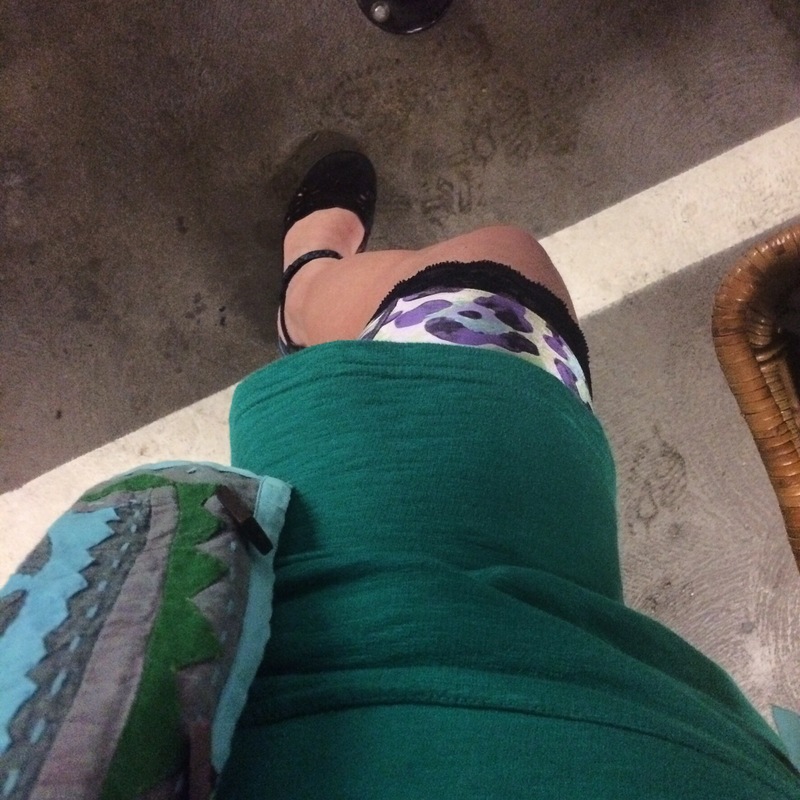 Bloomers of the day: Tie Dye Pettipants. 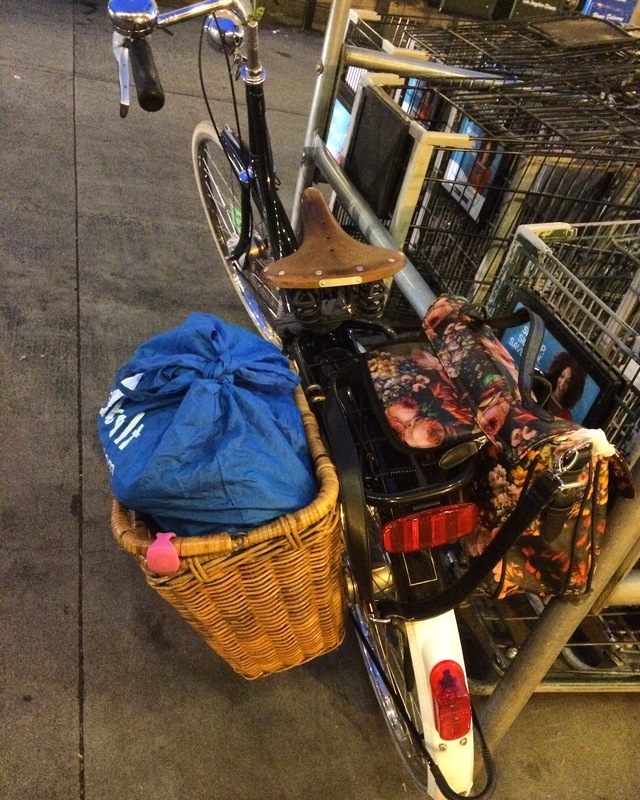 Errandonnee #2, March 10th: Stopped at the grocery store on my way home from the office. Category: Store. Miles: 1.7 (total from office to store to home). Bike: Gazelle. 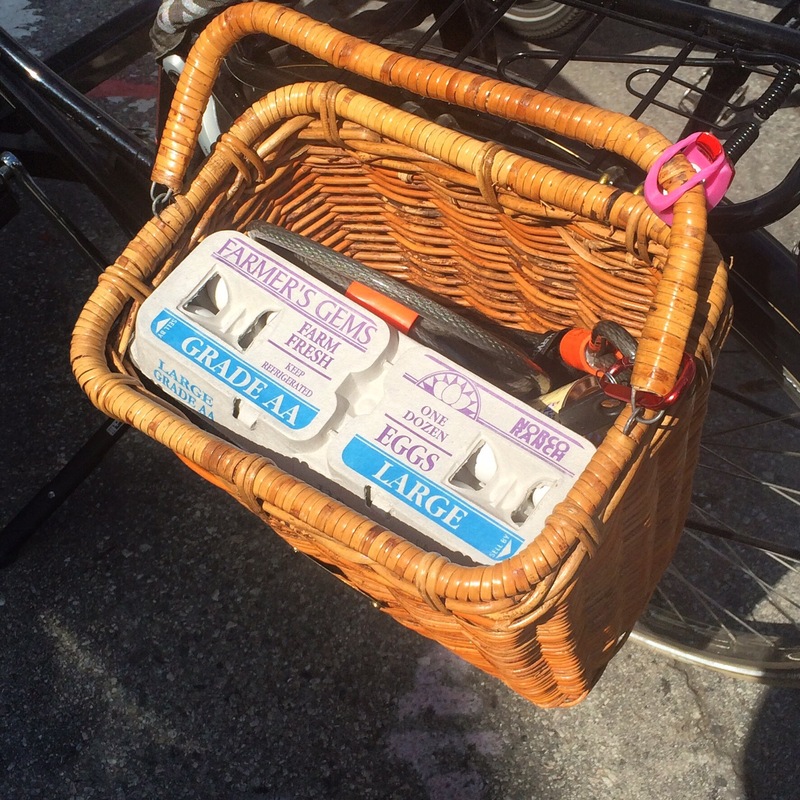 Observation: Packing the eggs at the top of the nylon shopping bag with the handles tied together, and then set inside my Nantucket basket pannier, provides a stable and secure means of transport for my groceries. I always worry about the eggs, but thus far, no casualties. Errandonee #3, March 11th: Usual commute to work, again taking the shorter route, as I’m still exhausted from my travels and running a bit late getting out of the house in the morning. Category: Work. Miles: 1.2 (2.4 if we count the round trip). Bike: Gazelle. Observation: Gray skies with rain in the forecast for the afternoon has me thinking about whether I will want a jacket for the ride home – or would that make things worse? I’ve got the right helmet, though. The Closca Waterproof Flatcap not only keeps my noggin dry, but the bill helps minimize the raindrops in my face and eyes. Bloomers of the day: Smokin’ Hot Flame Shorts. 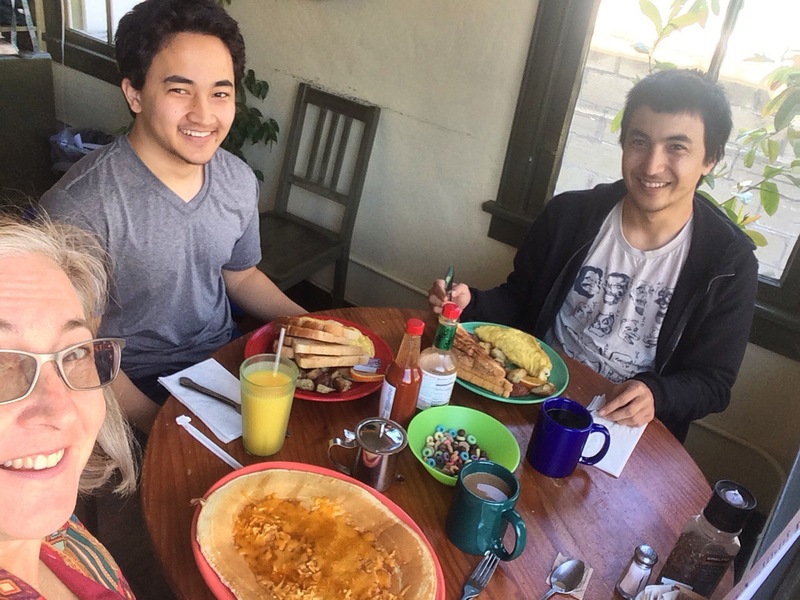 Errandonnee #4, March 12th: Breakfast outing with my sons to Grub (that’s the name of the restaurant) in Hollywood. 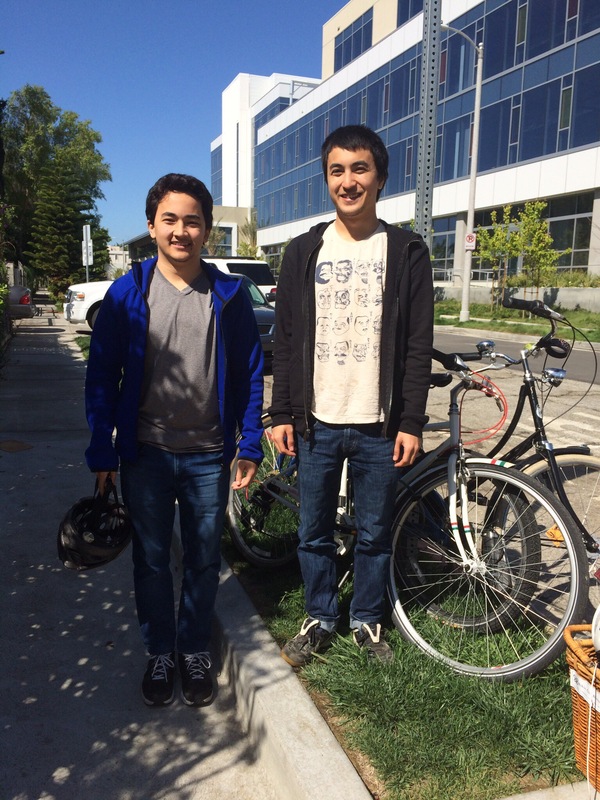 I raised my boys right: they both use bikes as their primary means of transportation. I was delighted to have them both home at the same time for a Spring Break visit. Category: Social. Miles: 7.6 (round trip). Bike: Gazelle. Observation: Without parking signs, many establishments would have absolutely no place to lock a bike! We locked all three bikes together with one long cable and a U-lock around the no parking sign on the grassy strip between the sidewalk and the street. 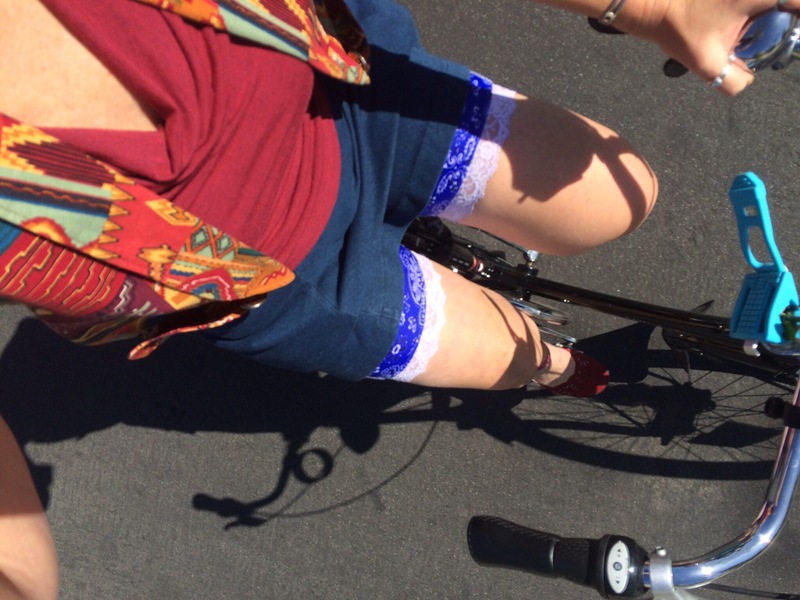 Bloomers of the day: Blue Bandana. 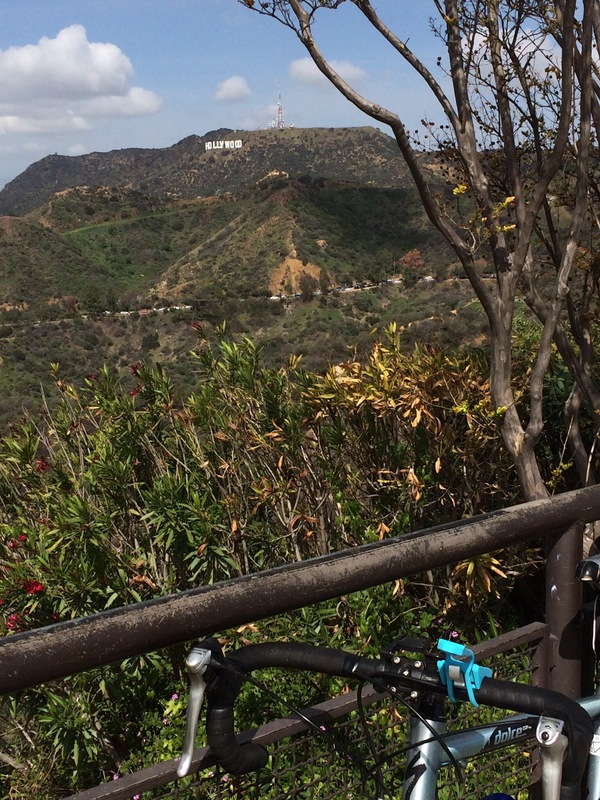 Errandonnee #5, March 13th: Spiritual recharge ride up to Griffith Observatory. Category: Personal Care. Miles: 23.9. Bike: Specialized Dolce Comp (Roadie). Observations: The golf courses at Griffith Park feature an impressive variety of trees, including oak, eucalyptus, redwood. I doubt many urban golf courses can top the foliage here. First time doing this route after some heavy rains means (1) there is a lot more bright green growth alongside Mt. Hollywood Drive, and (2) there is a lot more dirt and gravel washed across the road, requiring extra care, especially when going downhill in the hiker-heavy zone. Bloomers of the morning: Red Hot Aqua Dot. Adam makes it look like he’s having fun. Noah is a good sport. 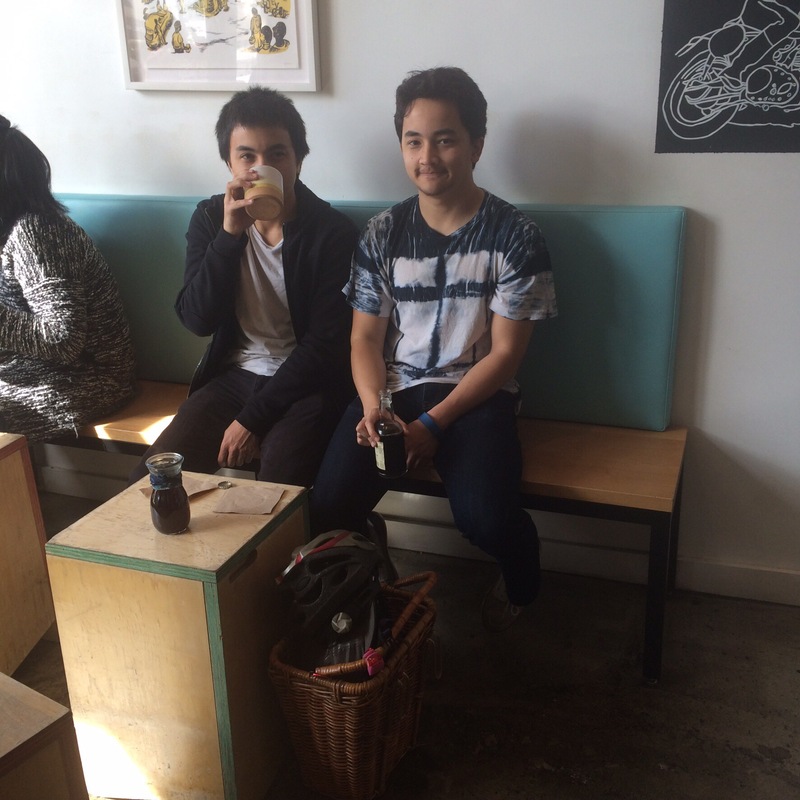 Errandonnee #6, March 13th: Coffee shop run with my boys to check out Go Get Em Tiger in Larchmont. Category: Social. Miles: 2.9 (one way). Bike: Gazelle. 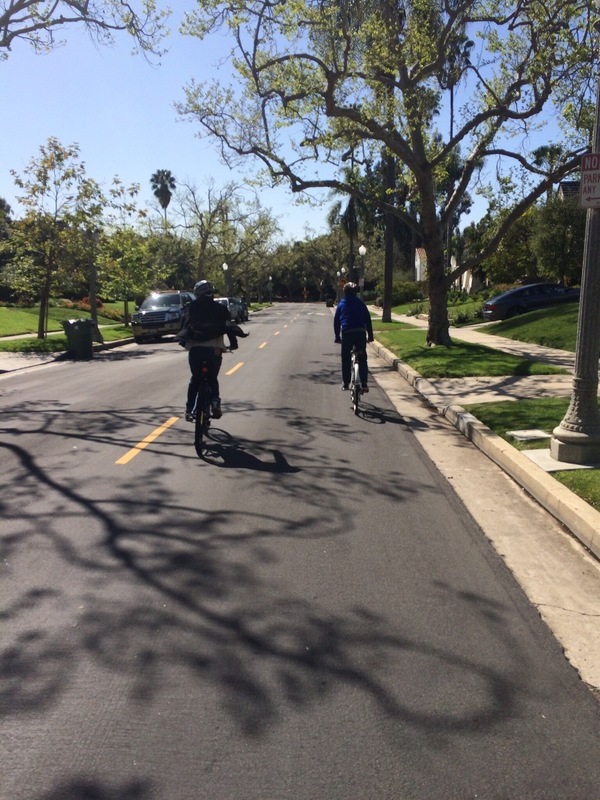 Observations: The new bike corral in Larchmont Village is nice – plenty of room for our three bikes – but the positioning relative to the adjacent angled car parking makes it awkward. I was nervous that the driver of the van parked right next to our bikes might no be able to see our bikes when getting ready to back out of the spot. 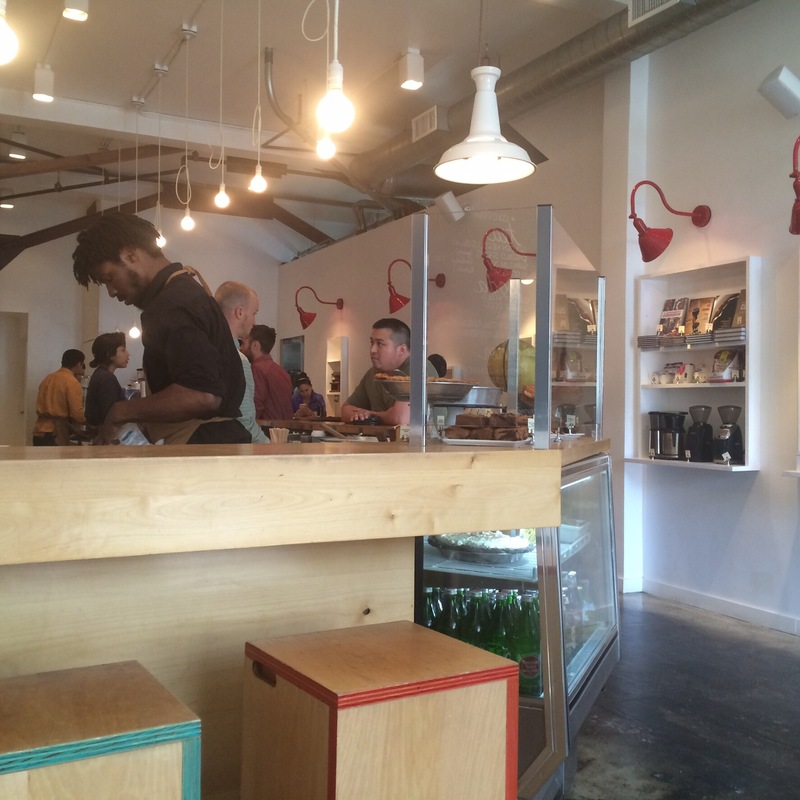 The sweet latte on the menu at Go Get Em Tiger is indeed sweet – in a good way, as far as I’m concerned. I will be back for some future coffeeneuring. Bloomers of the afternoon: Crazy Daisy. Locking up at the O.K. bike corral. 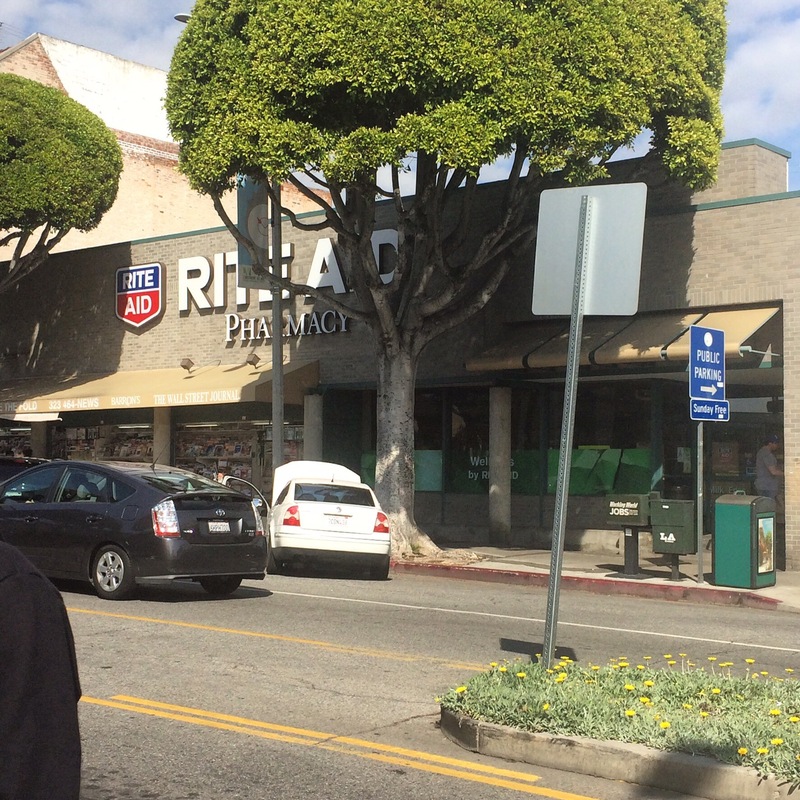 Errandonnee #7, March 13th: Stop at Rite-Aid for the eggs and milk hubby needs to make flan. Category: Store. 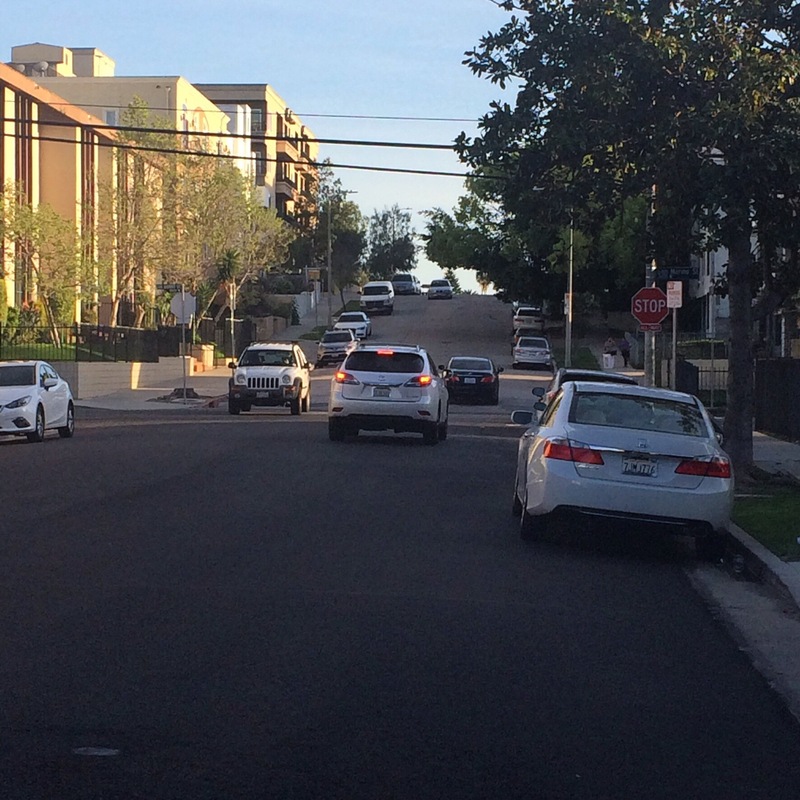 Miles: 0.05 (just down the block in Larchmont Village – there’s no minimum distance in the rules!). Bike: Gazelle. Observation: It’s amazing the groceries available at a drug store. We bought sweetened condensed milk, half and half, and a carton of eggs (yes, more eggs – he’s making two flans). 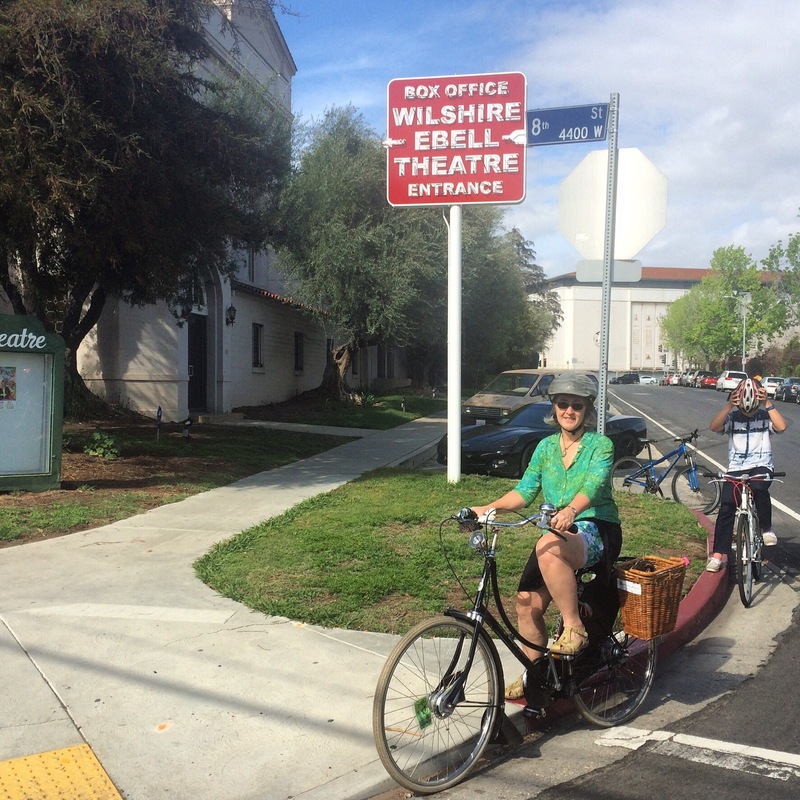 Errandonnee #8, March 13th: Stop to admire one of my favorite architectural gems of historic Los Angeles, the Wilshire Ebell Theatre. Category: Arts & entertainment (or Wild Card if need be). Miles: 2.75. Bike: Gazelle. Observation: Lots of motorists have to wait patiently for their turn to enter the parking lot upon arriving for whatever event is taking place there this afternoon. It’s so fun to zip past them on our bikes. Errandonnee #9, March 13th: Crazy run-around to figure out where to have dinner with my uncle and aunt, who had just arrived for a stopover on their way from San Antonio, Texas, to Monterey, California. Category: Wild Card (it was a wild ride, and my uncle is a real card). Miles: 1.8 (total). Bike: Gazelle. 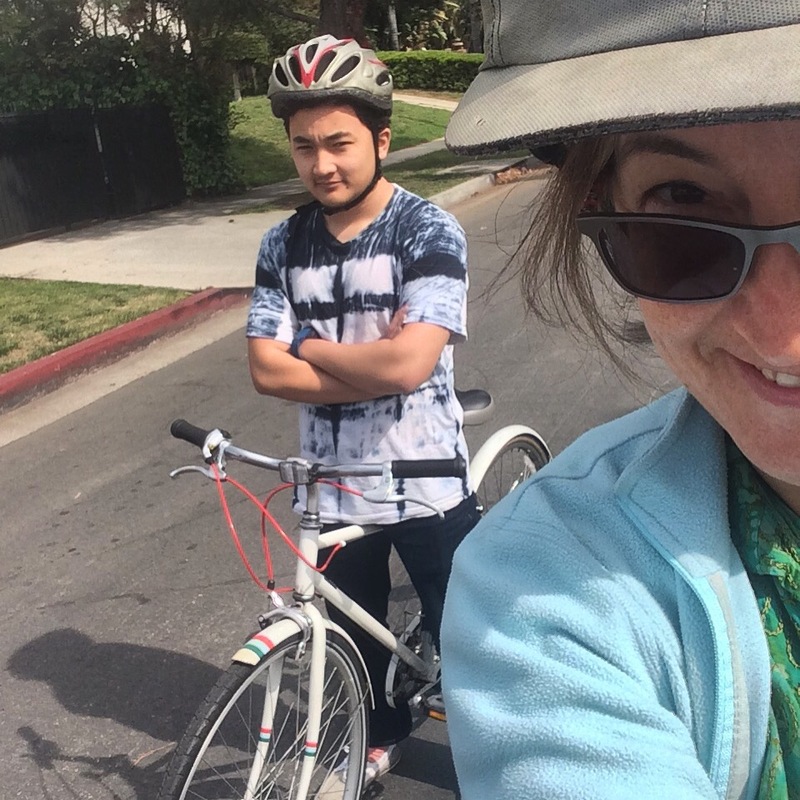 Observation: During the crazy run-around, I zipped around Koreatown on my Gazelle as quickly as the other two groups did in their cars. We had initially made arrangements to meet my aunt and uncle at a Japanese restaurant that is just over a mile north of us, but when we called to make a reservation, learned that they would not be able to accommodate both my uncle’s wheelchair and a party of six at the same table. That was disappointing. Then we settled on a place just under a mile east of us: Guelaguetza. Based on the size and lay-out of the restaurant, we thought it would surely be suitable for accommodating my uncle’s wheelchair and our group of six. The restaurant would not allow us to make a reservation on short notice, and then we discovered, after we got there, that the wait was going to be at least 45 minutes. The place was a mad-house, the parking lot completely jammed, and even trying to get through on the street was nearly impossible (for cars, that is). Who knew it could be like that on a Sunday evening?! Noah stood out in the street, near the entrance, to wait for my aunt and uncle to arrive, while my husband and I brainstormed on a back-up plan. Having ridden over on my bike, I’d noticed El Cholo, a Mexican restaurant just a few blocks from our house. Duh! Why didn’t we think of that in the first place? Hubby gave them a call to confirm that they could accommodate the wheelchair and our party of six, and away we went. 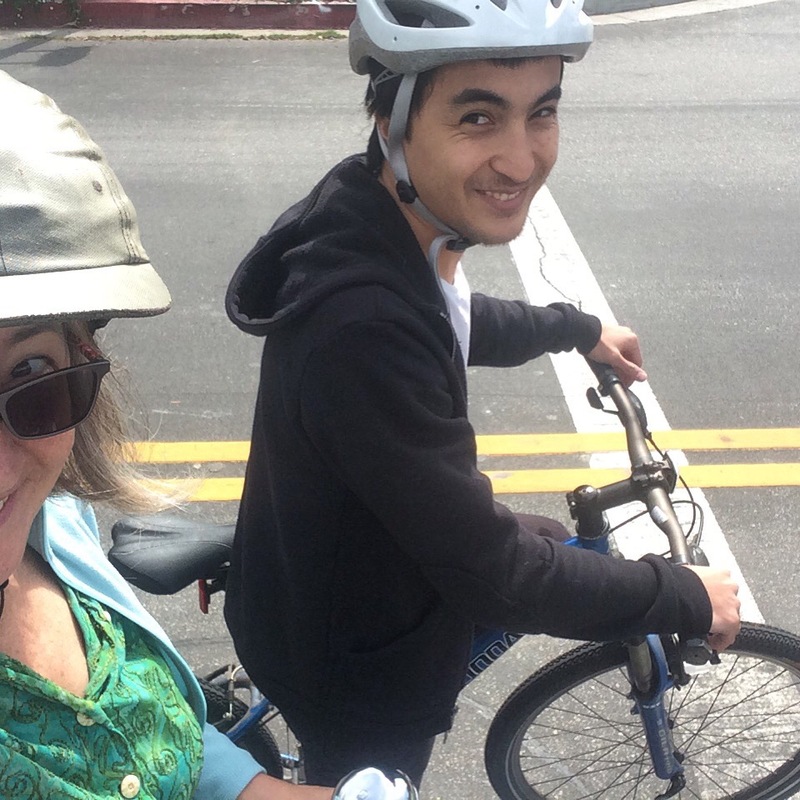 I was able to ride up alongside my aunt and uncle’s car at a key intersection and give them guidance on where to turn to find the entrance to El Cholo. It worked out perfectly. Whew! Good thing I was able to get 5 of my trips into one day! Errandonee #10, March 14th: Bringing 7 bottles of wine home from the office. Category: You Carried WHAT on your bike? Miles: 1.3 (one way). Bike: Gazelle. 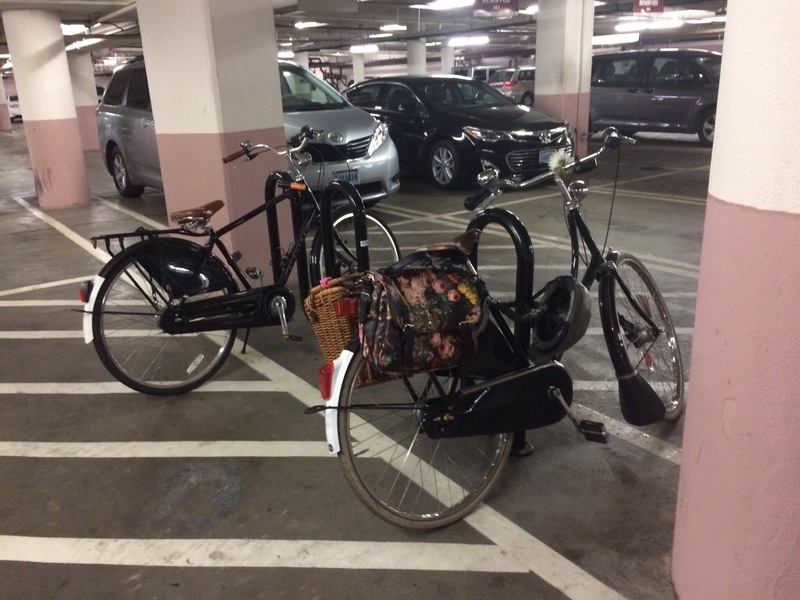 Observation: I wasn’t sure I could get up the ramp out of the parking structure carrying this much weight, without having to hop off the bike, but I did it! I had 4 bottles in one basket and 3 in the other, along with my computer, my purse, and my lunch bag with my empty food containers. 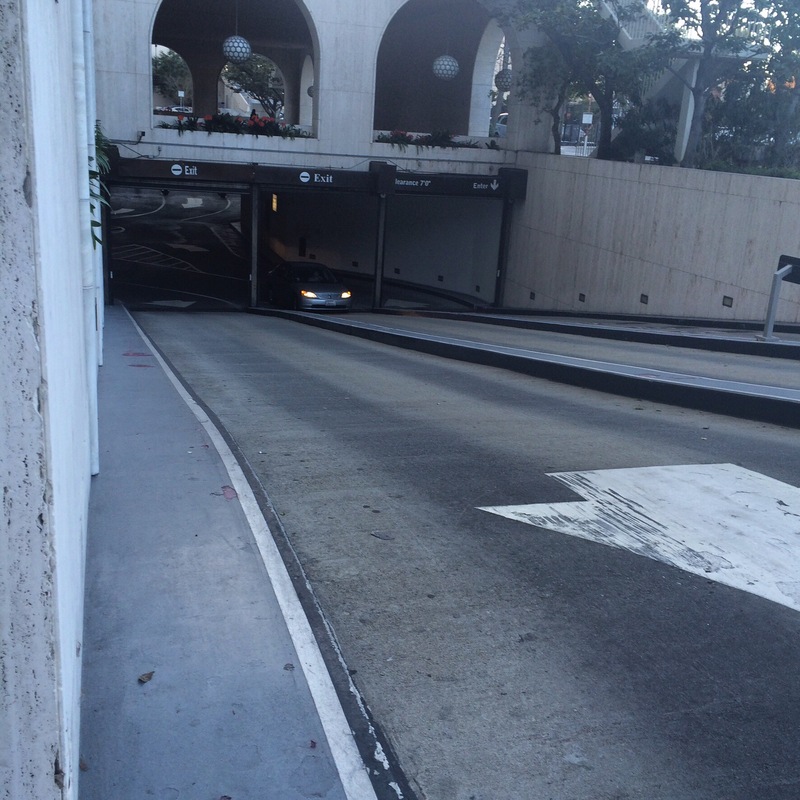 The entire ride, even the hill on St. Andrew’s Place, went more smoothly than expected. 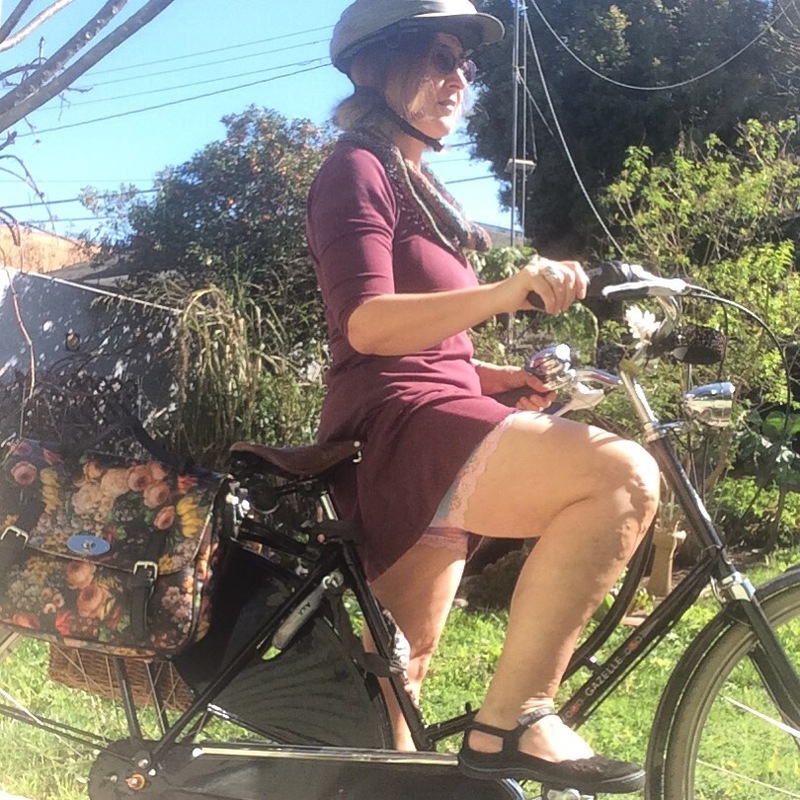 I think having the load balanced between the two basket panniers and relatively low on the bike made for a nice, stable ride. Bloomers of the day: Leaping Lady Leopard Shorts. I think these go well with my wine. I don’t get the appeal of tagging. Makes me sad. 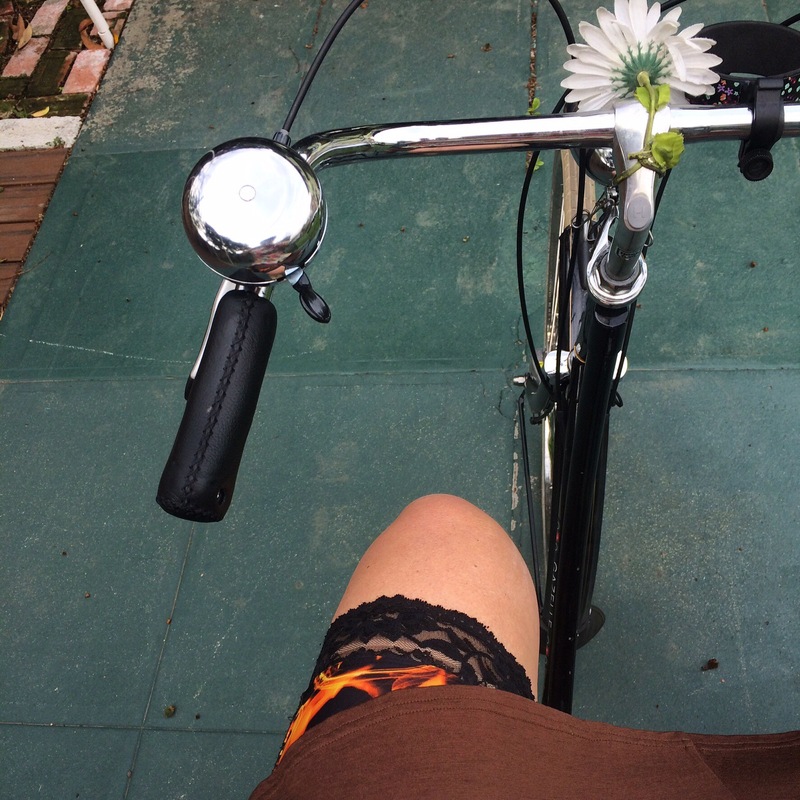 The dirties in the basket as I show off my bloomers. Errandonnee #11, March 15th: Drop off dry cleaning. Category: Personal Business / Non-store errand. Miles: 0.4 miles (one way). Bike: Gazelle. Observation: The tagging in Koreatown makes me sad. 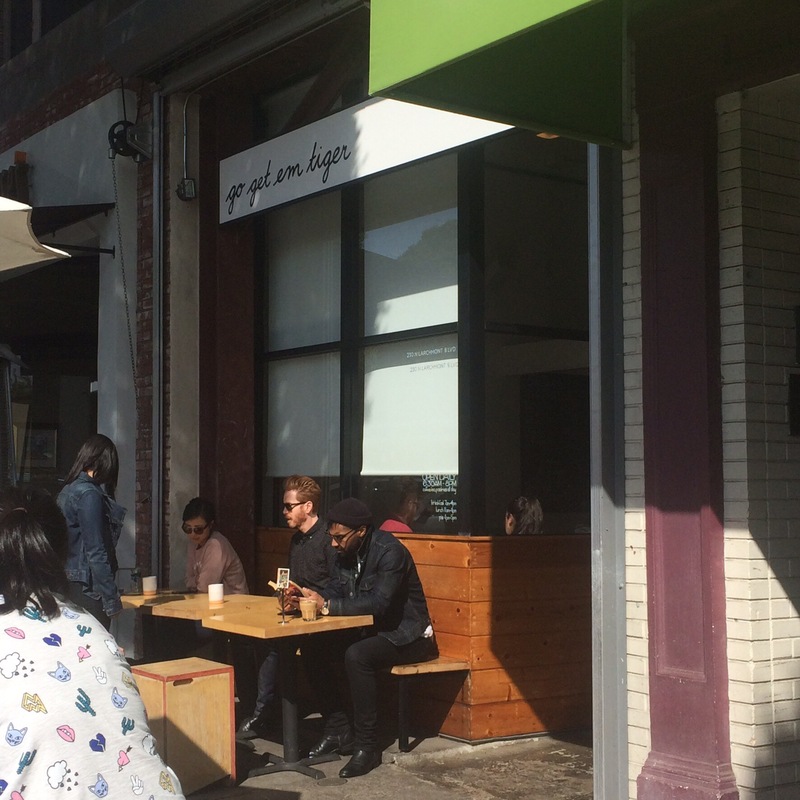 It is most unfair to our neighborhood business owners. Bloomers of the day: Pinka Dot. To the mailbox, for the win! Errandonnee #12, March 15th: Mail a payment to Pam, my graphic artist. Sure, I could’ve paid via PayPal, but that doesn’t involve a bike, so why would I? Category: Non-store errand. Miles: 1 (one way; add 0.3 for the rest of the trip home). Bike: Gazelle. Observation: The traffic light at Olympic Boulevard & St. Andrews Place changes frequently. During the time it took me to stop the bike, get the letter out of my pannier, snap a photo to document my errand, and drop the letter in the mailbox, the light went through almost three cycles! It’s a good thing I decided to throw in an extra errand by mailing the letter/payment on the 15th, as I had miscounted and this was not my 13th or bonus errand — it was my critical twelfth errand I very much needed in order to complete the series! Looking back at my effort to cram twelve errands into six days, I can’t say that I’m terribly proud of my showing. It seemed a bit lame, and I feel like I stretch the rules a wee bit here and there. I am pleased that I managed to pull it off, but the experience leaves me eager to do a better job of it next year. If nothing else, I look forward to coming up with a better submission for the “You carried WHAT on your bike?” category. I would love to devise a plan that makes for an impressive photo. But I did log a total of 45.8 miles (or 47.3 with parentheticals), so I feel good about that. Post Script: I thought I had until March 31st to submit my Errandonnee report. I’ve been working on it a little each evening, struggling to get it done. I just reviewed the rules and see that I’m a few days late. Will the Chief Errandonneur let me get away with a late submission? Fingers crossed. I want my patch!